We're lucky to live in New Zealand with it's year around world-class fly fishing, and I take full advantage of it. 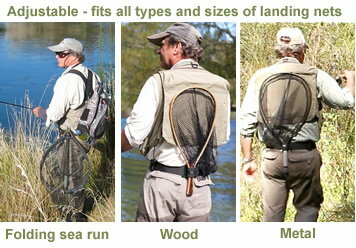 But it can often be a long hike to get to the best water and one day, while untangling my net from a bush for the 100th time, I came up with a better way to carry that all important part of a fly fishing kit. 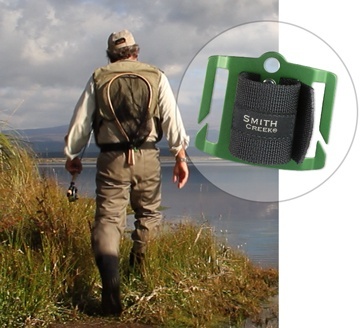 For years I'd do what one of my professional guide friends did and stuck the net handle in my wading belt behind my back. We've worn many a hole in the back of our waders that way and it's an unwelcome surprise when freezing cold water suddenly runs down your backside, usually in the middle of winter. 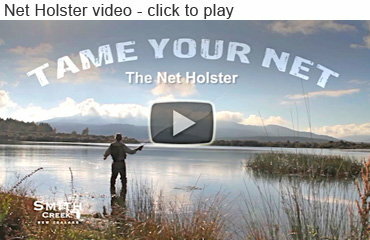 A few dozen prototypes and many fishing / field-testing days later (yes, someone had to do it), I'm thrilled with the Net Holster. 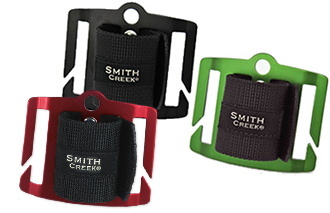 It works great, and it sure beats trying to clip a net behind your back. My guide friend is still using the prototype I gave him to test a couple of years back.